Talk About Emotions and Responses. 80 cards initiate casual or therapeutic discussions. Some cards feature facial expressions. 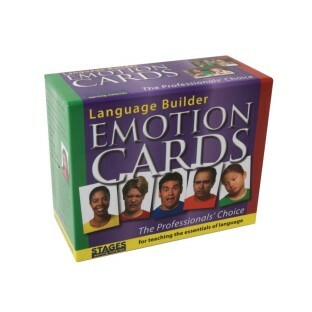 Initiate casual or therapeutic discussions with this 80-card set. Features facial expressions and reaction-provoking scenarios with men and women of various ages and ethnicities that will help clients identify with different feelings and emotions. Half of the images are shot against a plain background, showing only the upper body and face, and clearly depicting a single emotion. The remaining cards show people in real situations and activities with natural settings and contexts, inviting discussion about a range of emotions, why the people may feel that way, and possible responses to these feelings. Activity book included.